The parent(s) who can not agree on matters concerning the children may apply to the municipality’s family court. If this is not possible, AVA Advokater can assist you in matters of custody, living arrangements and visitation. It is important that you contact us early in the process, especially if you’ve received a letter from the counterpart’s lawyer. We at AVA Advokater offer a high level of expertise in the area and are diligent family law lawyers. AVA Advokater is your support throughout the court process and we also advise on how to act in relation to family law and social authorities who often play an important role in the outcome of these cases. We also explore opportunities for settlements through mediation. 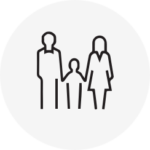 In the case of a trial, we have a proven track record with years of experience with family law cases. In some cases, joint custody is not appropriate. This may be the case when parents find themselves in difficult conflict or one parent reported the other parent for violence or abuse. The Court’s ruling in the custody issue shall be based on the best interests of the child in the individual case. Our lawyers have particularly high competence in assessing and acting upon the best interests of the child. Joint custody means that both parents have custody of the child and share the legal responsibilities. The starting point of Swedish legislation is that joint custody promotes close contact between the child and both of their parents. Joint custody requires that you as parents can cooperate in matters concerning the child, as you have shared responsibility for all important decisions regarding them. Our lawyers have particularly high competence in matters concerning child custody. The child may have a permanent residence with a parent and visit with the other parent. The child may also have alternate accommodation. The child’s will regarding living arrangements shall be respected as far as possible. In case of difficulties in regarding accommodation, you can turn to family court and apply for collaboration. If you do not agree on the child’s accommodation, you may need to apply for a court hearing. Our lawyers have particularly high competence in matters concerning children’s accommodation and alternate housing. An increasingly common type of accommodation for many children of divorced or separated parents is alternate housing. Alternative housing requires that parents cooperate and can agree on the daily needs and requirements of the child. It is important to distinguish between alternate housing and visitation as it leads to different requirements, for example: child support, maintenance and travel expenses. Our lawyers have particularly high competence in matters concerning children’s accommodation and alternate housing. Even after a separation, the children have the right to maintain contact with both of their parents in accordance with what’s best for the child. The will of the child will be taken into account in the question of access. In case of difficulties in reaching an agreement, you can turn to family law and apply for cooperation talks. If you as a parent need change visitation, you can apply for a lawsuit in court. Our lawyers have particularly high competence in matters of visitation. When a guardian with custody goes against the agreement by preventing the child from seeing the other parent without acceptable reason, it is referred to as “Visitation Interference”. There are many different forms of visitation interference. It can vary in severity. For example, by preventing visitation by moving so far away that visitation is hampered for geographical reasons, by travelling with the child or simply refusing to let the child see the other parent. In some cases, parents have legitimate reasons not to abide by the agreed upon terms. This may be the case, for example, if the child is not adequately cared for by the other parent, or is exposed to violence or substance abuse. You then have an obligation as a parent to protect the child. If you need to alter the terms of the agreement, you can apply for a court hearing. Our attorneys work on a daily basis with regard to visitation interference. AVA Advokater has the requisite skills and experience in such cases. We help parents in regards to child support. If the parent with which the child has his permanent residence has a lower income than the other parent, they can be entitled to more child support. If the parent with which the child has their permanent residence has a lower income than the other parent, one can be entitled to more child support. A parent may also be entitled to certain support in regards to alternate custody. We also explore opportunities for settlements and other agreements. It may also be a child support matter for a spouse / husband after a divorce if one partner has taken great responsibility for the family for a long time and because of the difficulty in obtaining an income. It is becoming increasingly common for citizens from different countries to have a family. Parents who end up in a custody disputes with international aspects usually need a lawyer who can take control of these complicated and very sensitive cases. In international family conflicts, situations may occur where one parent abandons or holds the child in another country against the will of the other parent. It may then be a breach of law according to the Hague Convention of 1980, which deals with unlawful abduction and detention of children. According to the convention one can request relocation of the child to their country of origin, in other words the country where the child has been domicile. In such cases the Foreign Office would often be involved. In cases that involve a country not covered by the Hague Convention it can be possible to legally push a case about the relocation of a child to the country of origin. The relevant court in Sweden is ‘Stockholms tingsrätt’ – the Stockholm District Court. AVA Advokater is one of the few law firms in Sweden who work with cases according to the Hague Convention and the abduction of children. AVA Advokater has extensive experience of family law disputes.